The RSTMOR Drafting PLUSS Chair from ErgoVerse is specifically designed to meet the needs of users with larger builds. Dual rectangular steel tube construction and extra-thick padding on the larger than average seat are combined with easy adjustability to create a chair that is both functional and durable. This chair offers users the option of sitting at a greater height than traditional chairs, greatly reducing the stress which repeated sitting and standing can put on the knees. An adjustable footrest provides relaxation for the feet and lower legs. For larger users who are working in a warehouse or assembly environment with raised counters this seat can enable them to reduce the load on their legs and joints while still being able to reach the work surface. The chair also folds for storage. RDPC-11190 RSTMOR Drafting PLUS Chair, Black. The NOSTND Perching Comfort PLUS Saddle Seat from ErgoVerse is designed to help users with larger builds work as close as possible to a raised workstation, particularly those built on top of base cabinets or shelves. Unlike the seats on a leaning seat or traditional stool, the large plush saddle on the NOSTND is designed to be straddled. Seated posture on the NOSTND is more upright, with the heels positioned behind the bend of the knees, rather than extended forward of the knees as they would be in a leaning position. (See the Tulean Leaning Stool, also from ErgoVerse, for an illustration of this latter position.) This posture allows the user to move in much closer to flat-fronted work surfaces than might otherwise be possible. 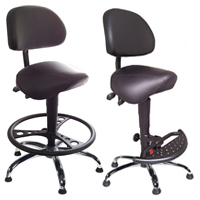 As a result, the NOSTND Perching Comfort PLUS Saddle Seat helps to reduce the risk of overreach injuries to the muscles of the shoulders and back, and the risk of injury to the muscles of the sides and mid-section caused by sitting sideways along the base of the workstation and twisting at the waist to get close enough to its surface. By supporting the majority of the user's weight on the seat, the NOSTND also helps to reduce the load generally borne by the feet and legs. Overall fatigue, and the risk of strain on the joints and tissues of the lower limbs can be greatly reduced. Larger users looking for a more traditional style of seat may be interested in considering the RSTMOR Drafting PLUS Chair, also from ErgoVerse. 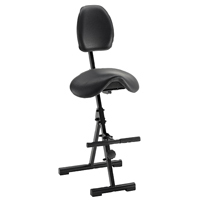 NP-CPSS-11194 NOSTND Perching Comfort PLUS Saddle Seat, seat height range of 23.25" to 28.75", BLACK, rated at 440 lbs. The GIGCHR Foldable Perching Seat from ErgoVerse is a temporary, foldable seating solution for a wide range of users. Designed for portability and weighing only 18.7 lbs, the GIGCHR enables musicians, public speakers and other users to easily transport the chair between venues or job sites. The chair offers a seat height adjustment range from 21.25" to 35.4" and an ample back height adjustment range, enabling users to position it to provide support where needed. The GIGCHR features durable rectangular tube steel construction rated to 264 lbs., simple folding hinges, and easy handwheel adjustment of the seat, back and footrest heights. The seat and back of the GIGCHR are padded for comfort and upholstered in black imitation leather for easy cleaning. The built-in height-adjustable footrest provides support when the chair is elevated, and can easily be folded out of the way when not required or for storage and transport. Optional accessories include a guitar stand and a beverage holder. GPS-F-11153 GIGCHR Foldable Perching Seat, Black. The EQUESTRY Saddle Seat from ErgoVerse positions the user in an upright stance that is known to encourage upper body movement and deeper breathing. Together these have the potential to improve overall circulation and increase the alertness of the user. The upright stance also naturally realigns the spine and reduces the potential for lower back pain which is often associated with extended sitting. In addition it provides users with a noticeably extended reach or "Comfort Zone" which reduces the risk of over-reaching. The EQUESTRY Saddle Seat comes equipped with casters which lock when weight is lowered onto them, meaning that the chair does not move once the user is seated. This makes this an ideal chair for those performing tasks which require fine control but a full range of movement. The full 360° of free rotation enables users to easily align to equipment or reach other work areas as needed. The EQUESTRY Saddle Seat features easily cleaned black imitation leather upholstery and a chromium-plated steel base for durability. The EQUSIT Saddle Drafting Chair from ErgoVerse features a heavily padded, tilting, bicycle style seat mounted to an elevated heavy duty steel frame. A gas spring provides a cushioned seat range from 27.75" to 36.6", sufficient to provide suitable seating heights for the majority of users. The wide back features 2" thick cushioning and has independent height and angle adjustments. Two footrest options are available. Model ESDC-83015 features a large 22.8" diameter heavy steel footring that provides a convenient 360° fixed footrest a minimum of 9" above the floor. Model ESDC-F-83016 features a folding 120° footrest with angle adjustment. For safety, the steel footplate has an aggressively treaded surface. Both footrests can be secured at greater heights if necessary. Both models have oversized 27" diameter Chromed Steel bases equipped with glides. 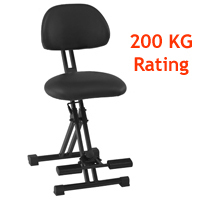 The large base and glides ensure stability when mounting and dismounting from the saddle. If desired, the base on Model ESDC-F-83016 can be folded flat for storage. ESDC-83015 EQUSIT Saddle Drafting Chair with Footring, Black. ESDC-F-83016 EQUSIT Saddle Drafting Chair with Angle-adjustable Folding Footrest and Folding Base, Black. The CITZ Saddle Seat from ErgoVerse is intended to provide industrial workers with a seating solution that can be an aid to improving their overall health and to encourage greater safety in the workplace. The wider stance when straddling a saddle seat provides users with a much wider range of reach, while at the same time ensuring excellent stability and control. The upright stance also provided by saddle sitting is known to encourage upper body movement which can lead to better and deeper breathing and has the potential to improve overall blood flow. Note: Sitting on a saddle stool elevates a user higher than a standard seat. Saddle stools are therefore not generally recommended as a replacement for seating at a standard office desk. Please call one of our Product Specialists to discuss your intended use of the CITZ Saddle Seat. We will be happy to help you find the best solution for your needs. CSS-11206 CITZ Saddle Seat, Black. The HNDSFREE Saddle Seat from ErgoVerse is ideal for use in sterile environments, especially those in which safety and security are important. The Foot Release Plate enables quick, easy, hands-free adjustment of the seat height from any point around the chair. Note: Sitting on a Saddle Seat elevates a user higher than a standard seat. Saddle stools are therefore not generally recommended for use at a standard office desk. Please call one of our Product Specialists to discuss your intended use. We will be happy to assist you in selecting the best solution for your needs. Equipped with special braking castors, the HNDSFREE Saddle Seat rolls freely when the user is seated but stops moving as soon as the user stands up. This innovative feature enhances the overall safety of the work environment, and helps all present maintain their focus on the task at hand. 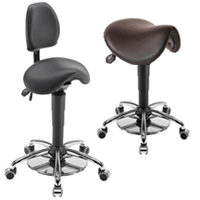 Both models of the HNDSFREE Saddle Seat feature easily cleaned Black Imitation Leather upholstery and a chromium-plated steel base for durability. Model 11209 offers all of the above features, with the addition of a firm, height and angle adjustable back support. (Note: The back on the 11209 has a 2.5" deep curvature in the middle, is 14" wide, and has firm edges. Some users with broader frames may find the back on this model too narrow and deep for a comfortable fit). 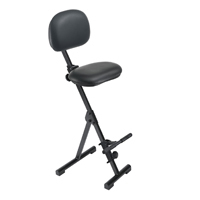 HSS-11305 HNDSFREE Saddle Seat with Foot Release. 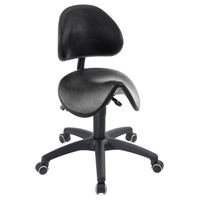 HSS-B-11209 HNDSFREE Saddle Seat with Foot Release and Back. The MVMNT Foldable Perching Saddle Seat from ErgoVerse is a non-swiveling, foldable saddle seat designed for smaller or average sized users working at standard or elevated workstations. The saddle design keeps the toes approximately in line with the knees (rather than extended forward of the knees as they would be on a leaning stool), allowing users to sit as close as possible to a work surface built on top of base cabinets or shelves. The MVMNT keeps the torso in an ergonomically desirable upright position, while at the same time providing stability and reducing the need to bend forward from the waist. This posture is especially beneficial when fine control is needed or when greater effort must be exerted. 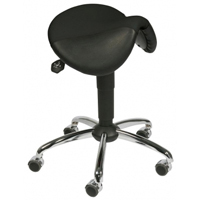 The small back rest offers temporary support for users who like to lean back occasionally. The height of the seat can be adjusted from 20.9" high, to 30.7" high. The height of the back rest adjusts independently to allow users to position support where it is needed. The seat and back rest are both padded for comfort and upholstered in black imitation leather for easy cleaning. The MVMNT features a foldaway adjustable-height foot-bar to provide a secure base of support when the chair is elevated. 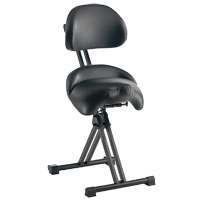 MPSS-F-11171 MVMNT Foldable Perching Saddle Seat.